Changes to the Safe Chat Phases! Realize this then i was browsing the safe chat uhh… words and noticed numbers and said it then all these people were wondering a bout it so i told them to visit here of corse without the . Here’s How To Do This Cheat. Open the safe chat list on Club Penguin. You will see the numbers! Check This Out, Club Penguin Removed the clock on the safe chat list! I think this maybe because some penguins were saying there ages/address (if they are smart and use latitude and longitude) with this clock! (All the penguins make codes with words or say something like jiberish but will say hello my name is Jonathan [My name is NOT Jonathan that is my brothers name] and I am 10 years old (I am Not! 10 ) )Anyway, Its Been Removed. It May come back like the heart did! I didn’t really use the clock times that much! But, its kinda mean to all those safe chat people who feel the need to shout the time! Club Penguin Series 4 Toys ARE OUT!!! 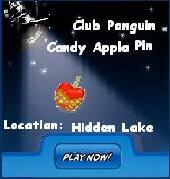 Hey Everyone its digo900 I found that the Club Penguin Toys Series 4 are out click on the link below ! New Igloo Music and Pin! I am not sure this is a hundred percent real but i did see a series 4 puffle i wanted to buy it but i had no money on me (why doesn’t my dad let me bring money?) but enjoy it i guess and if you stumble across a series 4 puffle comment here! I was on Club Penguin today and came across new servers on Club Penguin! Most of them are safe chat servers and some old servers are also now safe chat servers. Also Happy77 interviewed screenhog you can see the inter view here they also gave you a sheet of music for you to play at home maybe i will use it for my piano (or is it an Organ?) it can play music like different instruments like trumpet or an orchestra etc. also you can get new igloo music on Friday! Music Jam Is officialy over but starting next week you will be able to play certain instruments in the lighthouse!